What is cruise ship job? There are many people who dream about working on a cruise ship. But keep one thing in a mind that you are going to work there and not going on holiday cruise. Here you will find what cruise ship's job is really like. Cruise ship jobs give you good salary, you go to various exotic places where normally merchant cargo ships don't go. but its challenging job. You have to follow certain discipline, have to work hard min 10 to 12 hours a day and 7 days a week with smile on your face always. 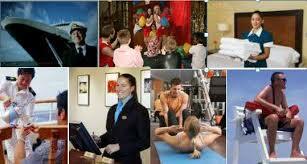 ​How many types of jobs available on a cruise ship? ​What are the wages on board cruise ships? Cruise ship salaries are higher than what you would earn ashore with your qualification and experience. There is no income tax on your earning, you get free accommodation and food hence you save most of your earnings. Cruise ship personnel are divided into mainly two groups, the people who get tips and who don't. Waiters, busboys /assistant waiters, bar waiters/waitresses, bartenders, cocktail waitresses, etc come into tipping catagory. Tipping personnel have a lesser salary. Most of their earnings are tips. The non-tipping personnel on cruise ships are those who serve the crew,they are not into contact with passengers - Staff Waiter/Waitress, Snack Steward, etc. They have fixed salaries. How is life on board cruise ship? Working on a cruise ship is unforgettable experience. You get chance to visit interesting places in the world. Although you have to do your duty when ship is ashore, still you get shore leave after your duty hours. ​How to apply for a cruise ship job? .Before applying for a cruise ship job, first read carefully about what are the positions in various departments in a cruise ship. What kind of job would you like to have and do you have necessary qualification and experience to work in that position. Remember that cruise companies are always looking for the best and freshers are unlikely to get a job. What documents and certificates are required? You require all the certificates and testimonials to back your claim of qualification and experience. Also certificates that you have completed maritime courses are required. They depend upon your position on ship. Following are required before you join cruise ship. 2. US C1/D1 visa and the visa for the country you are going to join. 3. Any other country's visa or work permits required, depending upon your nationality. Same will be informed to you by the recruiting agent from your country.